....does it have the correct area... or has a pulled slug? This application will show you how you can use analog proximity sensors combined with the signatureACE®'s high resolution and speed to verify hole quality. The Signature Technologies SA-2000 “SAM” module, and Signature Technologies “SamView™” Software package can be used to non-contact evaluation of specific features on manufactured parts. 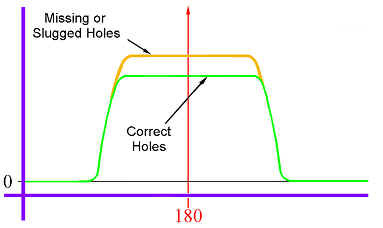 The illustrated method can perform the same type of test every stroke of the machine so the work pieces can be verified to have specific features present. The system works by applying the work piece precisely positioned relative to the analog proximity displacement sensor each stroke of the machine. 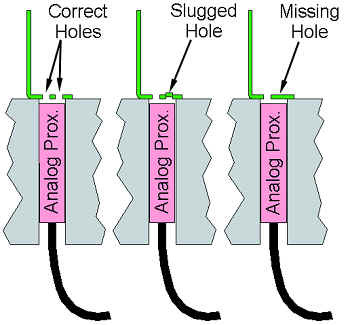 Since the displacement is always the same, the proximity then looks for AMOUNT of material in its sensing field, and if MORE material is present, then the indication is that a hole is missing, or its slug hasn’t cleared. Magnetic sensors have also a reaction to material variations, and magnetic history, so this method will not produce a precision measurement of the hole(s), but will easily indicate presence, absence, or gross deformity issues. The measurement cannot be calibrated, and must be used as a comparative measurement. Check other application bulletins for calibrated measurements.